Guitarist and composer Michael Rodach loves the absurd, the scurrility of everyday life, the challenge of improvisation, and the fact that every thing (except his six-stringed guitar), has two sides. If you look closely at the cover of his new album "Our situation seems strange“ you recognize a rubber raft with a sun umbrella floating all alone on the high seas. – cheerful, bright, and by no means lost – and you ask yourself if it’s a picture of someone who’s been totally deserted ,or someone in total comfort, in the very best of hands. "That’s the great thing about such pictures, that you can interpret them one way or another, depending on your mood. If I want to express a feeling of happiness in music, the result will be more intense if I add a drop of melancholy, because the possibility of loss is already inherent in that happiness,“ says, Michael Rodach, and decides to go for the total comfort feeling of the picture. He describes himself as a „lone wolf“ and likes to withdraw to his own personal island, far beyond the chattering and twittering of today’s world. „My island is completely fantastic. A magical island. If I feel lost in the great expanses of the universe, it conjurs me up a neat and peaceful little room all for myself. and if I feel closed in, it dissolves the walls of that little room and I can see far, far away. Seven years have passed since the release of his last album "On Air" ("A Trip in Psycho-Color." Keyboards 10/02). A very productive time for Rodach, in which he wrote and produced music for numerous radio plays and dance theater productions. Among others, the award winning (Radio Play of the Month, January 2006) "Hofmanns Elixier" –by Regine Ahrem and Michael Rodach, that casts light on the story of chemist Albert Hofman, discoverer of LSD, and places the discovery of the drug in the spiritual tradition of mysticism and ecstasy. "On the Attempt to Appease the Gods“ by Andreas Weiser is a piece about the little irrational rituals meant to guide us through the ups and downs of everyday life and "Das Todsündenprojekt" („The Deadly Sin Project“) - (directed by Regine Ahrem) a piece about hubris (pride and arrogance), and the story of a mysterious death. For the Snappy Dance Company (Boston) he wrote and produced the music to "String Beings, Martha Mason’s dance production of a reflection on , entanglements and dependency. Also during this time, Peter Schulze, who was then acting as artistic director of the Berlin Jazzfest, had the idea to start up a new live project, and a new trio was formed - with trumpeter Paul Brody and accordeonist Alan Bern, they recently released the album "Triophilia" at the „Jazzwerkstatt“. 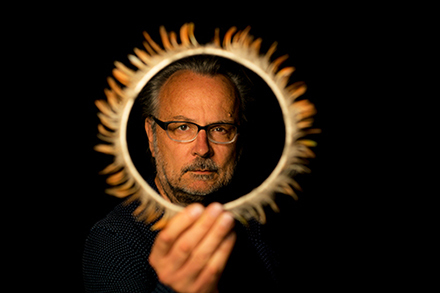 Rodach describes the collaboration with Alan Bern as an absolute stroke of luck, the two of them are currently planning the production of stage music for a well-known Belgian dance company. Rodach borrowed the title "Seltsam erscheint unsere Lage" (Our situation seems strange“), from Albert Einstein’s credo, which he wrote in 1932: "Our situation on this earth seems strange. Every one of us appears here involuntarily and uninvited for a short stay, without knowing the whys and the wherefore....". 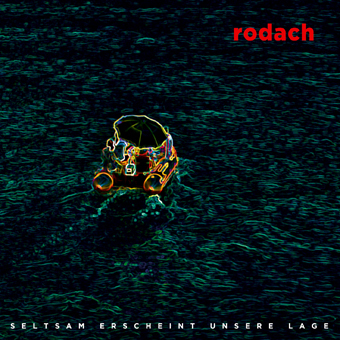 Rodach’s acoustic parallel universe oscillates, swinging between the earthy "Shake before using" and schimmering other-worldliness of "Lovely Darkness", mystical ecstasy of Das Elixir" and mysterious gravity of „Silent Wish", unreal, fragile and elusive. His minimalistic and introverted sound sculptures are unobtrusive, leaving the listeners room to draw their own pictures, They are fleeting figments of association that sound as if they were meant for the inner ear, the ear that pricks up and listens intently as soon as it hears the voice within.